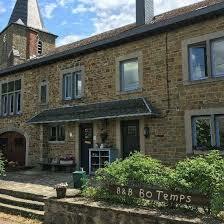 Most of the battle of the bulge tours start from our guesthouse “Bo Temps” . The guesthouse is situated in the hamlet Grandmenil, which was the center of heavy fightings during the Ardennes offensive. Between december 24 and the first week of january the villages in this area were severely damaged. On december 27th Grandmenil was liberated again by the 3rd armored division and the 75th infantry division. Our guesthouse has five rooms, inlcuding sanitary. Two of them are large 4-persons family rooms. It has a big relaxroom, seperate televisionroom, a cosy diningroom and a big backyard. Your hosts are well known with the Ardennes and can give you all kinds of advice about nice villages, breweries, chocolate factories and stores. The guesthouse is situated in the centre of the Ardennes and all the museums about the battle of the bulge are in reach between 20 and 30 minutes drive. The American cemetery’s Henri Chapelle and the Ardennes Americain Cemetery are also in reach. Besides the tour, you can ask your hosts to guide you further around. In the back of our yard, we have our own small museum, dedicated to the brave soldiers who gave their lives during the battle of the bulge. Since september 2018, Grandmenil is his own battle of the bulge museum, the MHM44 museum. Your hosts work close together with it and you can visit the museum with a special discount.